Frittatas share the billing with scrambled eggs in my book. Each is fairly flexible with regard to handling and each can assume a unique flavor profile depending on how the pairing options go. They’re kind of the chameleons of the egg world: give them a good mix of flavor to work with, handle them with a little respect, and they’ll be kind of whatever you want them to be. While there are various camps on just the right way to handle a frittata… from strictly over the stove to varying degrees of stovetop and oven finish… I like to camp with the side that takes the easy path. That’s what makes frittatas such a great option for a quick, easy and delicious brunch or an easy breakfast-for-dinner pick. And… I truly don’t think you have to have a gaggle of campers to opt for a frittata. It’s a doable and delicious option for two (or even one). Selecting the right size pan will allow for an acceptable density regardless of whether you are feeding twelve or two. With a frittata you can add whatever rings your bell. Go south-of-the-border with onions, peppers, tortilla chips and cheese; go classic with roasted potatoes, bits of crispy turkey bacon and green onions; the choices are unlimited. The key is thinking of the ingredients and how you want them handled to optimize flavor… sautéing onions and peppers, for example, before adding the eggs. In this spring-inspired plating, I roasted the asparagus just a bit before adding them to the mix because I wanted that flavor and texture to come through in the finished dish. And, because I was making a fairly small frittata, I amped up the “fluff” quotient by enhancing my three-egg mix with two frothy egg whites and a little dotting of a tofu-based cream cheese (regular cream cheese would be great too). 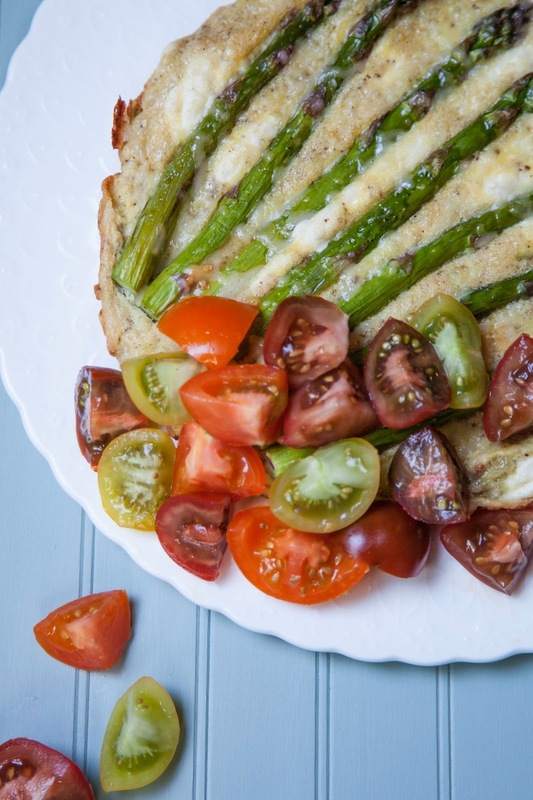 And, while we’re not at the height of tomato season, I did find a nice little mix of mini heirloom tomatoes at the market… a perfect little tumble of fresh, bright flavor to contrast the satisfying comfort of this frittata. And… given my penchant for electing the easy camp when it comes to frittatas, I get it going on the stove and quickly transfer it to the oven to finish up. It makes making frittatas such a great, easy option… more time for whatever kumbaya time that floats your boat. 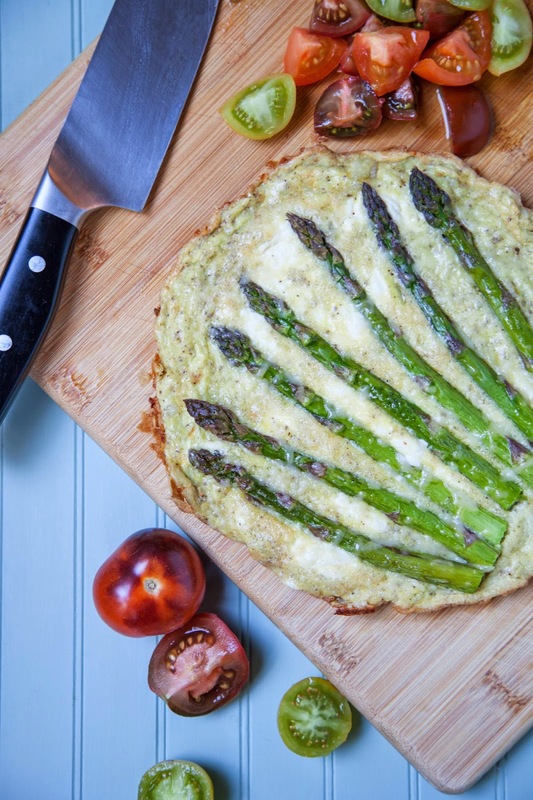 Place trimmed asparagus spears on a baking sheet, drizzle with olive oil and a pinch of salt and pepper. Toss lightly to combine and lay in a single layer. Place in oven to roast for 2 to 3 minutes. Remove from oven and set aside. In a small bowl, whisk 3 eggs until completely combined, about 1 minute. In a separate bowl, whisk 2 egg whites vigorously until frothy, about 2 minutes. Add egg whites to eggs and fold together gently to combine. Set aside. Heat butter in an 8" to 9" oven-safe skillet over medium heat. Add shallots and cook until just translucent, about 2 minutes (reduce heat to medium low if shallots appear to be browning). Add egg mixture and continue cooking, tilting pan to run mixture to edges, about 2 minutes. 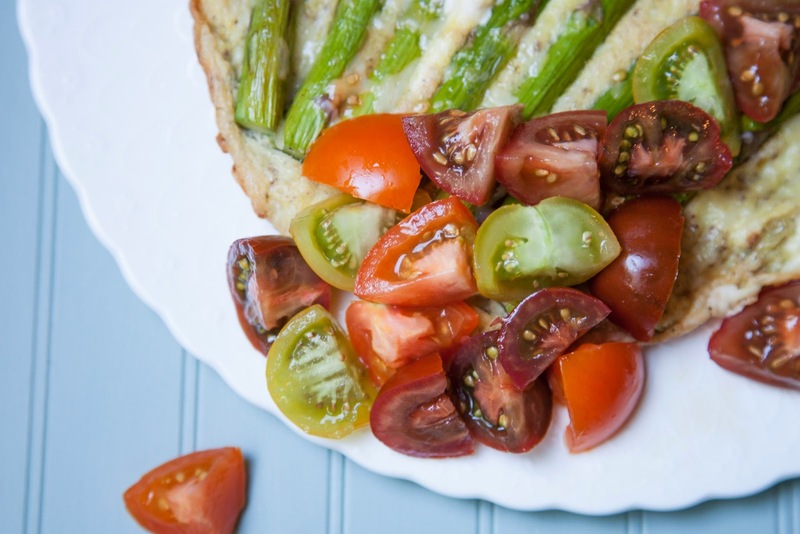 Dot eggs with cream cheese and fan asparagus over top. Place skillet in oven and bake 5 to 6 minutes, to set. Sprinkle parmesan cheese over top of frittata and continue cooking for another 1 to 2 minutes. Remove from oven. Serve immediately with cubed mini heirloom tomatoes that are lightly seasoned with kosher salt and pepper.